This is the last Rationally Speaking post, folks! It has been a long and fascinating ride. It began back in 2000, before blogs were a thing, with what at the time I called a (syndicated) internet column, and which became a blog in August 2005. Since then, I published or edited a total of 1208 posts (this is #1209! ), which have been commented upon 35,651 times and have been seen 3,880,694 times (not counting the one you are reading now, to be precise). Not bad for a one-man, one-editor (Phil Pollack), and a small number of collaborators (currently including Leonard Finkelman, Steve Neumann, and Ian Pollock) enterprise. As you know, there has been plenty of controversy on these virtual pages, at at times it has been harsh. But there have been also many many incredibly thoughtful conversations, from which I’ve learned a lot, seriously. A number of readers of RS love to engage in dialogue with me, and I sincerely thank them for their patience and contributions. However, I feel like I need a new project or two to re-energize my batteries, now that I have just celebrated half a century on this planet! Hence my decision to close Rationally Speaking (though the archives will remain available as long as Blogspot will host them) and open Scientia Salon (which you can, of course, follow on Twitter, Facebook or Google+). “Scientia” is the Latin word for knowledge, broadly construed – i.e., in an ampler fashion than that implied by the English term science. Scientia includes the natural sciences, the social sciences, philosophy, logic and mathematics. And Salons, of course, were the social engine of the Age of Reason in France and throughout much of Europe. The idea of Scientia Salon is to provide a forum for in-depth discussions on themes of general interest drawing from philosophy and the sciences. Contributors will be academics and non academics who don’t shy away from the label of “public intellectual,” and who feel that engaging in public discourse is vital to what they do and to society at large. The initial concept was inspired in me years ago by Noam Chomsky’s famous contention that “Citizens of the democratic societies should undertake a course of intellectual self defense to protect themselves from manipulation and control, and to lay the basis for meaningful democracy” (in his Necessary Illusions: Thought Control in Democratic Societies). But more recently what spurred me into action was an article by City University of New York’s Corey Robin, on “The responsibility of adjunct intellectuals” (published in Al Jazeera America). It’s a must read, and it’s most definitely not just aimed at academic adjuncts. Scientia Salon will also inherit some of the themes of Rationally Speaking, but there will be less emphasis on traditional skepticism and atheism, and more on philosophy, social science and natural science (with a bit of math and logic sprinkled throughout). The tone, hopefully, will be civil, thoughtful, as jargon-free as possible, and occasionally gently ironic (as opposed to overly sarcastic, something I must admit of which RS was occasionally guilty). The site will welcome comments, but there too, there will be a push to increase open and constructive dialogue and curb name calling and trolling. Consequently, while access to the site for reading will be open to all, in order to post comments it will be necessary to register with name and email address. Not much of a burden in these days of NSA surveillance, and — I hope — well worth the trouble. So, expect the first essay at Scientia Salon within the next few days. 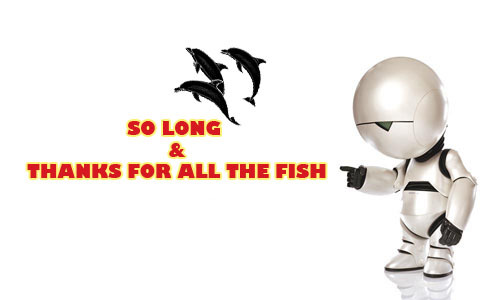 In the meantime, so long, and thanks for all the fish! Say what you will about the movie, (I enjoyed it,) but that is one hell of an opening number! A real shame! This blog has been one of the few atheism/skepticism-related sites worth reading. I look forward to seeing what you do in the future. Best of luck with the new project, and thanks for all the interesting contributions. I have been among those commenters to express dissent, and have always appreciated your willingness to engage in the comments section. Even when things have gotten heated, I've never felt unwelcome, and have always learned something from the discussion. My first reaction was... crap! Then I read on and Scientia Salon sounds pretty great! All the best with the new project, I will watch out for the first essays. I think the concept of Scientia Salon is great! An open - but rigorous - forum for intellectual debate and discussion; LOVE IT! I'll go over the guidelines, but in the interim could you let me know if there are any prerequisites to become a regular contributor? Jeffrey, there won't be any regular contributors. All submissions will be treated on a per case basis. Best of luck with the new site, Massimo! I'll be trolling around there quite often (by which I mean reading and learning stuff and not trolling people). I just subscribed to the new forum. I'm looking forward, but I'll miss this one, too, having been a subscriber here for many years (either as 'mufi' or 'jcm'). Massimo (and other contributors), I've been retired now for over two years and can't begin to tell each of you how much your posts (as well as the many thoughtful comments from commentators) have meant to me. It's been a real learning experience. I've been exposed to and challenged by viewpoints and subjects that have enriched my life. I hope to see the many commentators from Rationally Speaking on Scientia Salon. Everyone here has become part of a special community for me. Farewell! That blogs are mortal does not make them any less valuable or less meaningful. I'm not sure that I personally would be interested in Scientia Salon (I'll certainly give it a try), but there's nothing wrong with a site that doesn't have me reading it. I wish you the best in your new project. Congratulation on a job well-done and moving ahead into a much big territory. I am a new comer to RS but have enjoyed and learned a lot from it. Thanks the pond from a small fish. As you have mentioned Noam Chomsky, I hope that you can encompass the linguistics as a part of the new Scientia Salon. In my view, the following principle is a fun subject for discussion. The "Large Complex System Principle" (LCSP) -- there is a set principles which govern all large complex systems regardless of whatever those systems are, a number set, a physics set, a life set or a vocabulary set. Corollary of LCSP (CLCSP) -- the laws or principles of a "large complex system x" will have their correspondent laws and principles in a "large complex system y." Dangit! I just found this site earlier this month. I will be adding Scientia Salon to my daily reading list however. What are the plans for the Podcast? Is that also on the chopping block? No worries, the podcast will continue! Well that's a relief. It would be a shame to lose one of the best skeptical/freethinker blogs AND one of the best skeptical/freethinker podcasts at the same time. Looking forward to seeing what's going to happen over at Scientia Salon. Thank you so much! for all these years of soup for thought. Good luck with your next project, it sounds great. Thank you. I hope you keep RS up for a long time and maybe publish it in hard copy form. Excellent - but I notice that it doesn't have the series on morality. Do you have any objection if I make a small ebook of that series (for my own use) as that is just too much to read online for m.
Robin, I appreciate the thought, but I'd rather edit collections from RS. Indeed, one on morality was on my list, so it may come out this summer anyway. Stay tuned! So, Massimo, after reading this post I felt compelled to come here and thank you for everything you (and most of the other collaborators) have shared on RS. Though I've only engaged in a discussion once in a post, I've been regularly reading the blog (and a lot of discussions in the comment's section) for over 3 years now. So I feel like I should thank for everything I learnt from reading everything I've read here. Also I gotta say RS was one of my motivations to participate in a blog creation, along with other friends, to treat various introductory subjects and problems of philosophy. Wish you success with your new project, it sure sounds pretty good! Thanks for your blog. It always had something thought-provoking. Sorry to hear the news. Really enjoyed the thoughtful content. Which I’ll miss. But all the best with your new endeavours. You had me at but there will be less emphasis on traditional skepticism and atheism. I thank you and all the other contributors for making this blog a wonderful place to visit. And I thank you personally for being a strong voice for both philosophy and science. See you over on Scientia Salon! Good luck! Knowledge is thought and wisdom is truth so rather than naming your new place Scientia I would have called it Sophia's Salon, a place of absolute. Great run here Massimo. I'll be seeing you over at Scientia Salon. Sprinkle in more than just a little philosophy of mathematics/logic. Those are some of the best subjects around. I still think that "scientia" is a poor choice of words, since for many of the Latin-writing philosophers, "scientia" was an especially *narrow* and *strict* conception of knowledge, often influenced by Aristotle's notion of "scientific knowledge" as set out in Posterior Analytics (or, for people like Descartes, modeled after Euclid's Elements). That's just me nitpicking, though. Good luck with the new site! So at Scientia Salon "there will be less emphasis on traditional skepticism and atheism"... Heh, that seems sensible to me at this point. I appreciate your rational contributions to those two isms. Life is short. I do wish Scientia had tan pages or color instead of white (helps with damn eye floaters) but other than that it looks exciting. This has become one of my favourite blogs. The civility and actually living up to the title of the blog have been much appreciated. I'm glad to see that you're not giving up writing but just shifting to a different project.